Walmart's Mexico unit has penalised food companies supplying groceries to rival Amazon, pressure that has forced some to pull their products from the world's largest online retailer, four people familiar with the matter said. Walmart last year demanded discounts from food businesses whose products it found priced lower on the Mexican website of Amazon.com Inc, the people said, even though suppliers had no say in the Seattle retailer's decision to undercut Walmart on price. Two suppliers told Reuters they moved swiftly to pull their brands from Amazon, wary of jeopardising their relationship with Walmart de Mexico. The companies, both of which sell common pantry goods, said Walmart accounts for more than half their supermarket sales in Mexico. Walmart would not discuss its competition with Amazon in Mexico or the allegations made by suppliers. It told Reuters it does not dictate with whom vendors can do business. But it acknowledged it always presses for the lowest prices, particularly if competitors are giving shoppers a better deal. "We could never tell anybody that they can't sell to someone else," Ignacio Caride, Walmart Mexico's e-commerce head, told Reuters. "If we think there's an opportunity to lower our prices, because we see better prices at other retailers, we're going to negotiate for that access," he said. The company said in a statement that it aims to offer the lowest possible prices to benefit consumers, and doesn't subsidize losses for some products with revenues from others. Walmart is Mexico's largest retailer, commanding nearly 60% of the country's supermarket sales through more than 2,400 Walmart, Superama, Sam's Club and Bodega Aurrera stores. Its online business in Mexico is growing fast, but it represented just 1.4% of revenue last year. Amazon launched its Mexican website in 2015 and is now one of the country's biggest online retailers. It began selling groceries here in August. Supermarket analyst Bill Bishop said Walmart wants to avoid a repeat of its experience in the United States, where Amazon quickly took the lead in online grocery sales. 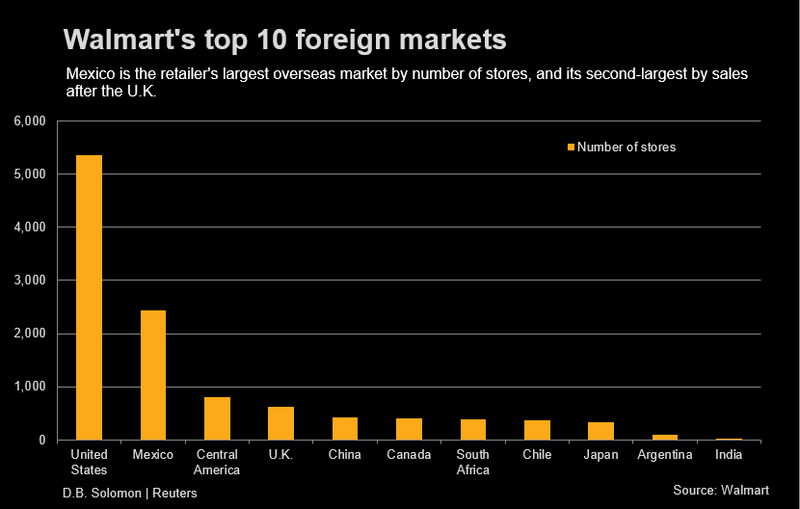 Walmart Inc's Mexico unit is its second-largest overseas market by sales after the United Kingdom, on par with Canada. "They're worried that Amazon will grow in Mexico," said Bishop, co-founder of retail advisory firm Brick Meets Click in Barrington, Illinois. "They're saying: Be aware of the fact that we're not going to make it easy for you to grow here," he said. The two Mexican suppliers who spoke to Reuters said they were caught in the crossfire. They said their wholesale prices were the same for both retailers, but that Amazon chose to sell their products to consumers more cheaply than Walmart did. Instead of lowering its retail prices to match those of Amazon, Walmart took it out on them, the vendors said. Walmart docked their payments by the retail price difference, multiplied by the amount of stock in its inventory, a move that cost them tens of thousands of dollars collectively, the people said. Both said they entered into talks with Amazon shortly afterward to drop their products. They said they could not afford continued financial clawbacks from Walmart. Nor could they risk losing their biggest customer, despite the huge sales potential offered by Amazon's platform. "It's a threat, and it's coercion," one of the people said of Walmart's strategy. Emails between Amazon and one of the food companies, seen by Reuters, support the version of events described by suppliers. Two other people familiar with the matter who have expertise in e-commerce in Mexico gave similar accounts. A cellphone message sent by another supplier to one of the e-commerce professionals discussing its woes with Walmart, reviewed by Reuters, likewise confirmed the situation. Experts say Walmart's pressure on its suppliers in Mexico is unlikely to have legal repercussions. Miguel Flores, a former member of Mexico's competition commission, said a government investigation into abuse of dominant market power would be complex, lengthy and hard to prove. Mexico's competition regulator declined to comment. Walmart, the world's largest bricks-and-mortar retailer, and Amazon, the No. 1 online seller, are vying for consumer loyalty worldwide. Both companies have been pressuring suppliers for the lowest prices on goods from t-shirts to bicycles. And Walmart has spent big to build up its shopping website, delivery network and cloud computing infrastructure to compete with Amazon online. Still, Amazon has raced ahead in online food shopping. It notched $3.4 billion in US grocery sales last year compared with Walmart's $2 billion in US online food sales, according to Boston-based research firm Edge by Ascential. Amazon's grocery selection in Mexico currently is limited to non-perishables, such as coffee, beer, pasta and canned vegetables. Walmart offers a wider selection, including fresh foods such as lettuce and chicken. Walmart brought its concerns about Amazon's lower prices to a number of food suppliers in Mexico, including multinational firms, around the time that Amazon launched its food and drinks web page, said two of the people in Mexico's e-commerce industry who requested anonymity due to the sensitivity of business relationships. They said some of the biggest firms figured out ways to appease Walmart, such as packaging their products for Amazon in sizes different from those sold at Walmart, they said. But many of the smaller companies lacked the know-how to negotiate, they said. 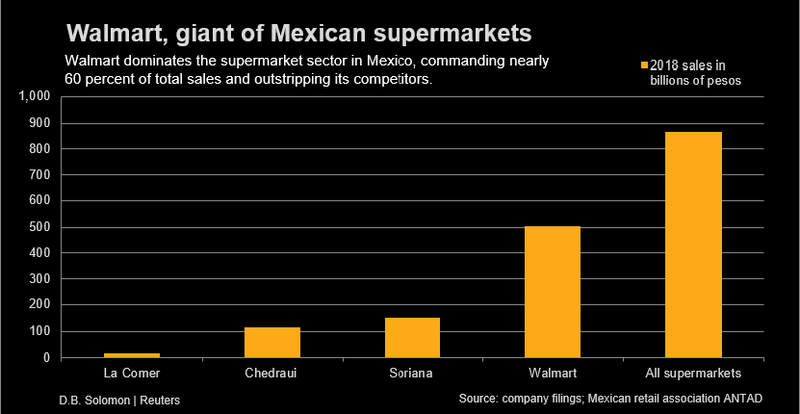 Bishop, the supermarket analyst, said Mexican suppliers feel enormous pressure to stick with Walmart, at least for now. "The dilemma is that Amazon is a very rapidly growing channel," he said.